the investment confidence and investment and household outlooks of the 16 million households in America with more than $500,000 of investable assets and those with at least $1 million, respectively. Instituted in February 2004, the indices serve as a predictor for financial advisors and providers as they navigate volatility in 2016. When analyzed by gender, our indices reveal a consistent confidence gap between men and women investors. Men are more likely than women to be more engaged with the market and have more confidence in financial factors, such as household income, household assets and the economy, that impact their daily lives. 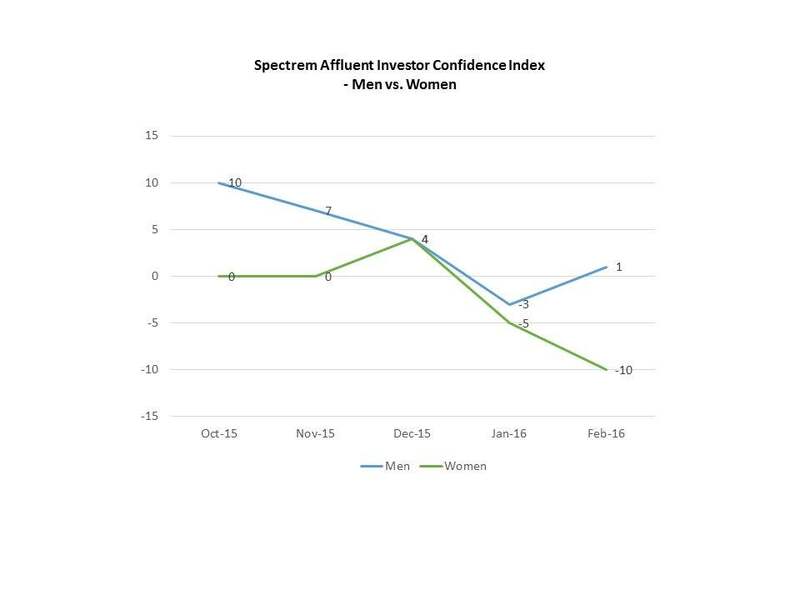 For example, the February Spectrem Affluent Investor Confidence Index (SAICI®) for men is at 1, while for women it is at -10. The Spectrem Millionaire Investor Confidence Index (SMICI®) for men is at 5, while for women it is at -4. The previous month, the SAICI for men was -3, while for women it was -5. The January SMICI for men was -1 and for women, -8. Our research of investor attitudes and financial behaviors finds that women are more likely than men to self-report a lack of confidence in their financial knowledge and investment acumen. More men that women, for example, indicate they are “very knowledgeable” or “fairly knowledgeable,” while women are likely than men to say that they are “not very” or “not at all” knowledgeable. One of the drivers of the Spectrem Affluent Investor indices is an investment preferences survey in which Affluent investors are asked how they would invest $100,000 in the coming month if it were made available to them. In February, more women than men indicated that they would hold on the investment sidelines and not invest (39 points vs. 32 points). Intention to invest in Stocks was significantly higher for men than for women (31 points vs. 16 points, while women were more likely to say they would invest in Cash (24 points cs. 19 points). Another driver of the indices is the Spectrem Affluent Household Outlook. In February, the Outlook for men was at 6 points vs. 2.08 for women. Men reported greater confidence than women in Household Income, Household Assets, Company Health and the Economy. Throughout 2015, our Affluent Investor indices were significantly higher both Affluent and Millionaire men than for their female counterparts. In September, for example, each index dropped three points following a tumultuous August for the market due in large part to China’s economic slowdown. At that time, the Affluent Index was at 9 for men and 0 for women, while the Millionaire Index was at 12 for men and 2 for women. Likewise, the Specrrem Affluent Household Outlook was higher for men than for women in 11 of the 12 months last year. Even in February, when the SAICI rose to a five-month high on lower gas prices, a strong jobs report and a strong Dow performance, the Household Outlook for men was roughly 35 points compared to 19 points for women.